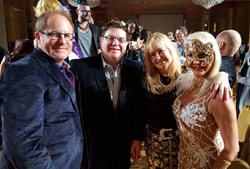 AMG Founder and President Paul Mengert and AMG VP May Gayle Mengert (center) with Dwight Ensley and Carolyn Woodruff at the January 31 Big Hair Ball to benefit Family Service of the Piedmont. Family Service is all about building healthy communities, something AMG is passionate about. We were delighted to be a part of their mission. by supporting this year's Big Hair Ball. AMG, Association Management Group of Greensboro, one of the Carolinas’ largest professional homeowner association managers, was a sponsor of The Big Hair Ball on Saturday evening, January 31 at Greensboro’s Elm Street Center. The event, a masquerade ball featuring edgy fashions, big hair, food and drinks, was presented by The Guild and Junior Guild of Family Service of Greensboro Foundation, Inc. in support of programs for Family Service of the Piedmont. This year’s event drew more than 550 community advocates and raised more than $120,000. The Ball benefits Family Service, the largest nonprofit agency of its kind in Guilford County. Family Service supports thousands of children and adults facing domestic violence, mental health issues and financial stability challenges. In its 4th year, The Big Hair Ball featured a cocktail reception followed by a runway fashion show spotlighting one-of-a-kind outfits created by area and student designers. AMG promotes a culture of giving in its five offices across NC and SC, not only for the positive impact it has on its home communities, but also on the company. AMG boasts 100% staff participation in service activities, through contributions of time, talent or money. “AMG understands the importance of contributing to local service organizations like Family Service of the Piedmont,” said Paul Mengert, President of AMG and a Cashmere sponsor of this year’s ball. “We supported the excellent efforts of this nonprofit to assist challenged families by sponsoring an evening of fun and truly unique fashion. Family Service is all about building healthy communities, something we’re passionate about, and we were delighted to be a part of their mission.” To learn more about Family Service of the Piedmont, visit safeandhealthyfamilies.com; for more about the sponsoring Guild, visit http://www.guildfsgso.org.